The DAC-01 stands out with its high fidelity vacuum tube output . With no less than five sources signal inputs for selecting : DVD/CD, AUX, coaxial, optical and USB input. This is easy the best bang for the money. XiangSheng DAC-01 lets you ?upgrade? the music listening experience, for any type audio setup, from computer-based systems, to network music devices, or standard CD/DVD etc. Just plug it into your existed setup and enjoy the superior high end sound quality. (DVD/CD, AUX), (1) coaxial, (1) optical and (1) USB input.
? (2) sets of RCA outputs ? transistor and vacuum tube.
? Built-in headphone amplifier: allows you to enjoy music with privacy. Great power, music layers and details.
? All resistors and capacitors are audiophile grade to ensure sound quality. Key parts are from Germany and Taiwan etc..
? R-shape high efficiency transformer.
? Separate power supply rectification to analog and digital circuits.
? Gold coated RCA connectors and coaxial connector.
? Vacuum tube output use well-known Chinese 6N3 tube. It can be replaced with 5670 type of tube.
? Brushed aluminum (7mm thickness) faceplate, with all metal buttons and knobs, plus blue LED indicator light.
? 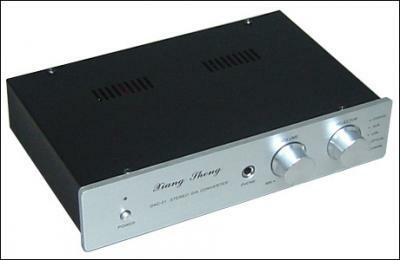 It's not only headphone amplifier but also pre-amplifier.
? Having two RCA analogy un-balance output(Normal Output and Tube Output), can be connected to transistor amplifier and tube amplifiers .